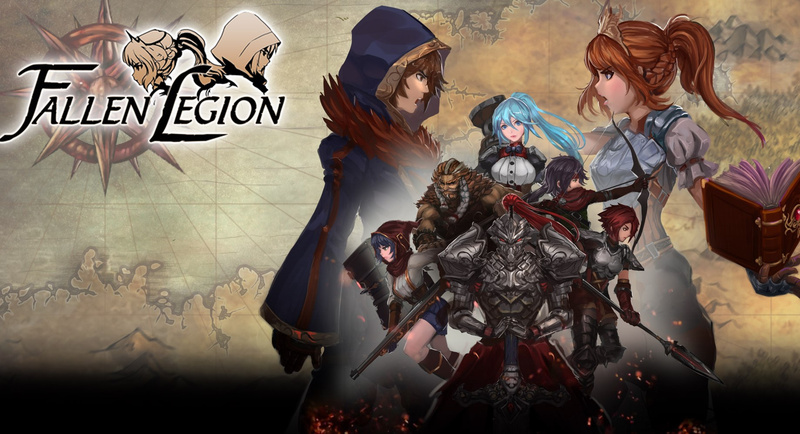 Having already slashed up a storm on other platforms, the Fallen Legion series is finally making a beeline for Nintendo Switch - and its arriving in 2018. The new Rise To Glory collection will unite Fallen Legion: Sins Of An Empire and Fallen: Legion: Flames Of Rebellion (which were previously released on PS4 and PS Vita respectively) for the very first time, as well as packing in new routes and extra content to make the fresh collection all the more appetising to new and old fans alike. The Fallen Legion games tell the story of a war for the land of Fenumia, with each game following the same conflict from the perspective of each side (in this case it's Princess Cecille's story in Sins Of An Empire and the man leading the coup against her, Legatus Laendur in Flames Of Rebellion). It's a neat little concept, with control of your 2D squad locked to the face buttons. Add in the ability to choose the path of each game's story via decision-based cards and you've got one fast-paced tactical RPG on Switch. How many games are they announcing just today? Looks fun, i will give it a try. These kinda games keep me occupied on the go. I will buy anything by YummyYummyTummy Inc, even though I have never heard of them before. Some people buy for the graphics, some people buy for the gameplay, others buy for the soundtrack... but not me. I'm going to buy for the developer's name! According to the developer and other reviewers, it's an action RPG, not a tactical RPG. Which immediately got my interest as there's not enough action RPG's made anymore, at least on the systems I've owned . I've never really liked turn based RPG's which has always annoyed me as I want to like them and I like the parts in between. The combat in this one seems a bit strange though, not sure I'd like that. The reviews for the PS4 game are average to decent but the Vita game's reviews are worse. @ogo79 Cant say how much this made me laugh xD! Sounds cool. I'm glad some of these digital only titles on PS4 and Vita are getting ported to Switch. There's a lot of digital only titles on Vita that I passed on because of the ridiculous cost of the Vita memory cards. Nice, looks kind of enjoyable and the music suddenly got interesting at the 1 minute mark. I'm glad indies are on board BUT if thats all Nintendo has from third parties next year I'll be massively disappointed. @JJ286 What do you mean, this one game for the whole of 2018?? @YANDMAN I mean that I don't see much big third party game announcements other than new indies and if Nintendo's game for next year are just Nindies with First Party I'll be hugely disappointed. lol im telling you, these game companies are getting sillier by the month. Hmm. I don't know yet. Give me some time. @JJ286 So far from what i can remember iv'e got Blade Strangers, Gal metal, Wonderboy, Street Fighter collection and Runner 3 on pre-order, plus some others i cannot remember. @YANDMAN so indies and an old game collection? Exactly my point. Damn, eShop only. Maybe Limited Run will do it, since they’re already doing the PS4/Vita versions?